When Mordesh are taken captive by the Dominion, their fate depends in large part on their importance to the Exiles. Those Mordesh prisoners deemed to be valuable captives are held and interrogated until such time as their continued usefulness is brought into question. 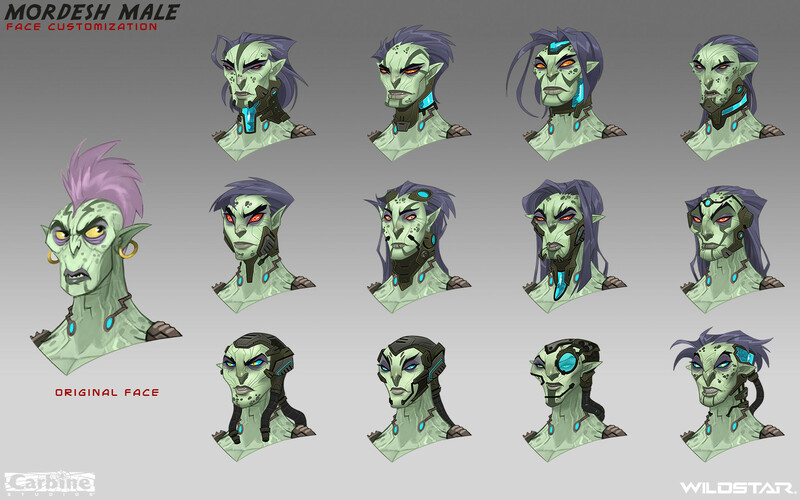 Mordesh captives who are considered nonessential to the war effort are typically executed due to concerns over the Contagion. 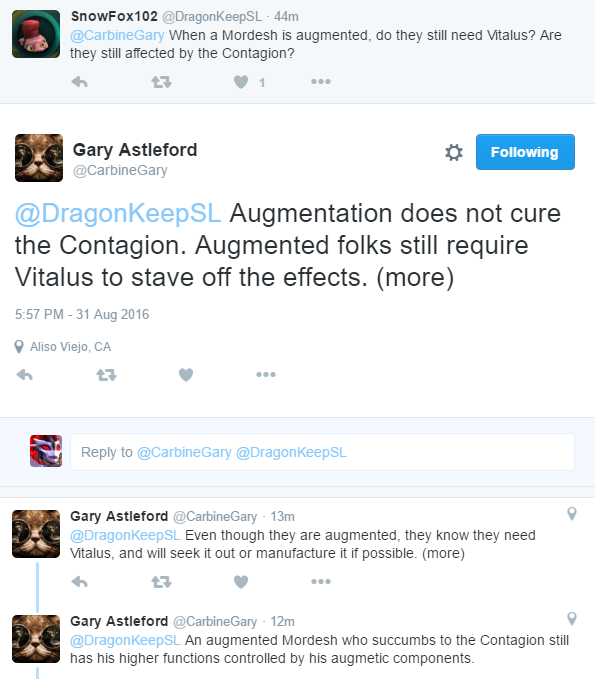 Prior to their executions, the Vitalus reservoirs of all Mordesh are drained by Dominion biotechnicians. The bulk of the collected serum is used to prolong the lives of important Mordesh prisoners during their interrogations, while a lesser amount is sent to both the Royal Collegium and DREDD for analysis. Reapers are charged with hunting down and euthanizing Ravenous Mordesh. In addition to destroying Ravenous, Reapers are also responsible for disposing of their bodies, typically by burning them. Theirs is a grim task that tests the heart and sanity of even the most hardened Mordesh. Few Reapers are left unscathed by the work they perform, and many are taciturn and gloomy (even when compared to other Mordesh). In addition to combating the Ravenous, Reapers are also responsible for putting individual Mordesh out of their misery before they can become a threat. Such activities are rare so long as there is plenty of Vitalus, but when supplies become scarce the Reapers make preparations for the inevitable culling. As such, Reapers are both respected and feared by the Mordesh people. After seeing so many Mordesh lives snuffed out due to the Contagion, most Reapers are ready and willing to accept their own demise at a moment’s notice. Stories of Reapers sacrificing themselves for the greater good are all too common. Such Reapers are honored in a thick book known as the Lexicon of the Lost, where the details of their deaths are recorded for all time. Reapers are organized into squads of various sizes, but which typically consist of between 4 and 10 members. Each squad is commanded by a Grim Reaper – a Mordesh with extensive experience in the field and who has survived multiple outbreaks. Fell Reapers, of which there are typically two or three per squad depending on size, act as non-commissioned officers. The other members of a squad are referred to simply as Reapers. The most experienced Reapers aspire to the rank of Harrower. Harrowers, who oversee the operations of several squads, are only called in during the most dangerous outbreaks of the Contagion. A collection of two or more squads under the command of a Harrower is referred to collectively as a “Shroud.” In other Reaper parlance, any operation against hostile Ravenous is referred to as a “Harvest,” which is further identified by a code name (for example, “Blue Harvest”). Likewise, an operation where Mordesh who have not yet become Ravenous are euthanized is referred to as a "Culling," no matter the size. 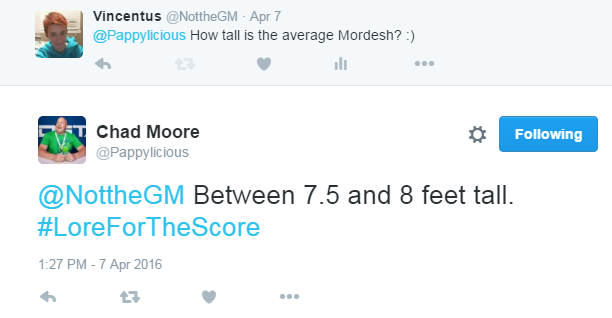 Asked Pappy about Mordesh heights last week because none of us can seem to come to a conclusion, and got the following answer. Now we know! There is a height chart that was posted ages ago. The argument was that the chart wasn't official, so I went and found the "official" answer. The chart puts them just under the 7'5'' mark. 2.20 is only 7'2''. 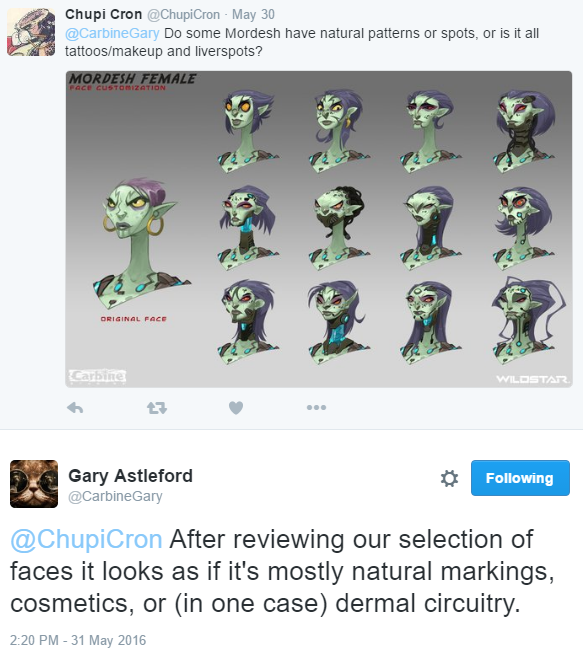 Reposting this reply: It’s not an accurate chart nor is it official, but it still gives a ballpark estimate of all the races side by side on account that it uses the in-game models. Small discrepancies aside, it’s still a height chart and gives a rough view of what to expect. For the most part, people can base their characters heights off of it. That doesn’t make it entirely useless because it’s not lore-accurate; people are still going to RP too-short, too-tall, and otherwise irregular sizes because they can. It's great that we have the official word. Until Pappy, Hernco, and the others put out the official chart, this can work as a loose-but-close reference for other races. A few inches, give or take, isn't going to break RP. Never said it would. Just adding something to the thread that I found to be useful. Special thanks to Mei Lei for asking a rather interesting question! This'll be added to the FAQ. Will also be happy to make a thread here on WSRP for anybody who would like to add their own ideas if the interest is there for it. Thanks!